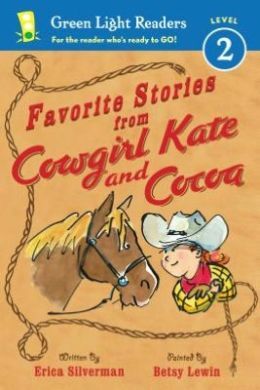 Best friends Kate and her horse, Cocoa, team up for two delightful stories in Favorite Stories from Cowgirl Kate and Cocoa. In the first story, “The Surprise,” Cocoa shows his impatience when Kate enters the barn with a surprise package. Cocoa wants his surprise immediately. He refuses to eat his breakfast and shows his irritation when Kate grooms him. When Cocoa takes a bite out of his new straw hat surprise, Cocoa learns his lesson about being impatient and obstinate. In “Bedtime in the Barn,” Kate camps out in the barn with her pet horse, Cocoa. Each time Kate attempts to settle down for sleep, Cocoa has a request, like fluffing his straw, hunger, or thirst. Once Cocoa is finally satisfied, Kate can’t fall asleep. Cocoa saves the day when he sings her a sweet lullaby and snuggles close to her on the straw. The Cowgirl Kate and Cocoa series by popular duo Silverman and Lewin are familiar titles with teachers and librarians and have been reissued under the “Green Light Reader” category. The Kate and Cocoa series is a Level 2 Green Light Readers story, for those who can read with help. The most difficult word in the story is the word “curried,” used when Kate grooms the horse. With sentence brevity and simple vocabulary, children will feel great success when reading this story. This book is appropriate for late kindergarten grade level or early first grade level. This book would be an excellent read for children who need to learn about patience. The humorous ending of the story helps children learn a lesson, but chuckle along with Cowgirl Kate as Cocoa gets his just reward for acting petulantly. The second story in the book is perfect for children who are thinking about getting a pet. Children learn about being a responsible pet owner and the needs and requirements of an animal when Kate camps out in the barn. And lastly, another bonus for reading this story is the enjoyment of the friendship between Kate and Cocoa. 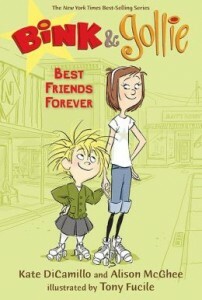 Young readers internalize the concept that not all best friends are the two-legged kind! To make this book even more fun to read, readers can build a fort in the house or classroom with sheets draped over chairs or a table. Then, place a flashlight inside the “tent” and dim the lights in that area, if possible, and allow the children to read by flashlight and pretend to camp out in the barn, like Kate does. For follow-up reading activities, teachers or parents should check out the teachers’ guide icon on the left margin of this page: http://www.ericasilverman.com/works.htm. Also after reading the story, make a bar graph of the students’ pets. Which pet is the most popular? The most unusual? Smallest or largest? Discuss at length the responsibilities of owning a pet. Talk about the needs and requirements of the different pets in the class graph, as well as the cost and emotional responsibilities of owning a pet. Where is baby hiding? Under a blanket? Behind a chair? While baby plays a game of hide-and-seek with Mama, other babies in the animal kingdom are hiding as well. Baby deer disappear in dappled spring sunlight. Baby polar bears vanish in the snow. Baby wolves dash into their dens. Gailbraith’s simple, lyrical language used in a repetitive fashion will not only assist first graders with their reading skills, but the descriptive verbs will also enhance their vocabulary and comprehension. The payoff at the end of the story is a tri-fold picture reveal, which conveys the message that no matter where babies hide, Mama is always nearby. Back pages offer “More About Babies” information, where readers can learn a couple of fun facts about each featured animal (e.g., a baby otter is called a pup, a baby elephant drinks 48 cups of mother’s milk each day, a robin chick weighs less than a quarter coin at birth, etc.). Butler’s adorable full-spread illustrations capture the fine details of these sweet baby faces, and no doubt will win over the pre-K through first grade audience (even my 5th grader could not contain her squeals of delight!). Drawn with acrylic and color pencils, the soft lines and soothing pastel palettes are instantly calming, just right for any kind of downtime: a classroom story circle or a bedtime read-aloud. Monsters are a familiar problem for children at the first grade reading level. Helping youngsters find ways to deal with the idea of monsters in a way that is fun and empowering for them is not easy. This book, whether used to build comprehension or as a read aloud, will help youngsters deal with some of their terrors. 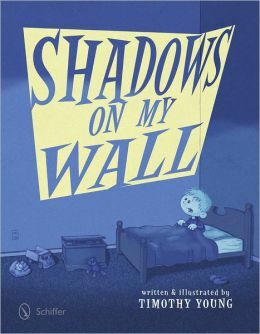 Shadows on My Wall is a well-written and illustrated picture book that will capture the imagination of youngsters. It opens with a little boy’s bedroom at night, light from the streetlights shining in through the window with very creepy shadows on the wall by his bed. While it is clear these are simply spooky-looking tree branches, soon the boy’s imagination takes over and they look more like monsters to him. But maybe they aren’t monsters. Maybe they are dinosaurs, and dinosaurs are pretty cool. The boy’s imagination keeps on working and the shadows take on new form after new form until the boy makes a shadow of his own. That is the beginning of the boy’s ability to take charge of those pesky shadows. This is very empowering for little ones. A spread at the back of the book shows several shadows children can make with their hands and how to do them. The author/illustrator has a web site at www.shadowsonmywall.com, however, there are no teaching materials there or on the publisher’s website. There are three other picture books by the same author, two of which have monster themes. Friendship trumps all. You may be tall and trying to prove your royal antecedents, or short and working to make yourself taller. There may come a hiccup or two in life, but Bink and Gollie remain BFFs. The book contains three short stories, simply told, but not simple. The theme of this book, part of a series, is acceptance. ‘Queen Gollie’ finds Bink’s door shut to her, but Gollie is warmly welcomed. Bink’s Stretch-O-Matic just stretches Gollie’s credulity. The ending is classic: Bink and Gollie stretched out on a rug looking at the contraption. “It makes me feel taller just to look at it,” said Bink. “Art can have that affect,” said Gollie. And the art that accompanies the text, deepens and enriches the stories. In the best picture books, the illustration shows a dog with an attitude or a quirk that the words don’t describe. Tony Fucile is an artist whose drawings gently nudge the story into the stratosphere, the illustrator who, you pray silently, would agree to illustrate your books. Such thought and planning has gone into the drawings. First graders will find many details: the telescope on Gollie’s balcony, the sit-out bench situated on another branch, Bink’s Bink-sized mailbox. The picture in Bink’s living room is a portrait of the inventor of peanut butter! Sly humor abounds. “Excessive assembly required” say the instructions on the Acme Stretch-O-Matic. What a wonderful read aloud of a book for the very youngest set. The expressions tell the story, even to those who can’t read yet. “Alrighty then” may soon become a frequently heard phrase. And this is not all. 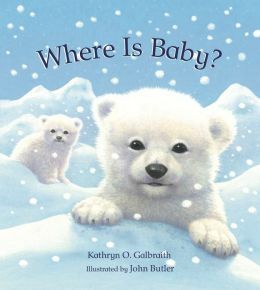 The publisher has a teacher’s guide, http://www.candlewick.com/book_files/076363266x.btg.1.pdf, to facilitate discussions and reading activities. Little Annie and her older brother, Simon, return in a precious story about healthy and happy, sibling relationships. Readers first met the sister brother duo in Annie and Simon, by Catharine O’Neill, released in 2008. In this first grade chapter book, Annie, Simon, and their dog, Hazel, have four adventures. In “Living Things,” Annie draws wildlife pictures while at a lake, though Simon sometimes struggles to recognize the subject of each of his much-younger sister’s artwork. 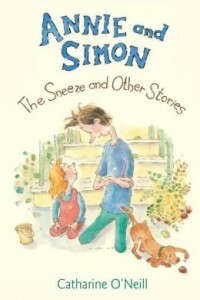 When Simon sneezes in chapter two, Annie is convinced he is ill and wants to nurse him back to health with a story, a duck blanket, a violet hankie, and gummy bears. Once Simon is settled on the couch, Annie snuggles sweetly with him under the blanket, and he reads the story to her. The family dog, Hazel, is the subject of chapter three. Annie draws pictures of her dog until the Gray Cat Next Door wanders into the yard. Annie then decides a cat might make a better pet. When Gray Cat catches a mouse, Annie remembers how much she adores Hazel. And, finally, in “Horse Chestnuts,” Annie and Simon collect a wagonload of horse chestnuts, only to have them stolen and buried by a squirrel. Adults will want children to read this delightful book to counteract the many stories available on sibling rivalry. O’Neill writes about siblings who have a harmonious relationship, with no jealousy, bitterness, fighting or arguing, prejudices, or favoritism. This book would benefit children who have a difficult home life or a broken home in which they’ve possibly been removed from a beloved sibling or step-sibling. This story could also help children learn to appreciate an older or younger sibling and look for the positives in that relationship. Only-children in a family could get a glimpse into the life of two or more children families. And, this story would make a great read aloud for a three- to five-year-old child whose mom is expecting a new baby. To amplify the theme of the story, a teacher could incorporate this reading activity: Use a bulletin board to show each child’s family tree. The child can write on strips of green paper cut in the shapes of leaves the names of each family member and the relationship and attach it to a construction paper cut-out of a leafless tree with branches. Allow and encourage the sharing time to create pride in the sibling relationship or an appreciation of the family member. This kind of activity also helps classmates learn about other families and family members, thus bonding the classmates, creating a “family-type” relationship within the classroom. Dodo is a blue baby bird out for his first adventure walk in the world with Mama. He loves to sing and walk and make new friends. Sometimes, though, the world can be a scary place, like when the leg you grab onto isn’t your Mama’s. He has several adventures that first grade readers will enjoy particularly because they have experienced the same things. The font is large and bold so beginning readers and emergent readers will be comfortable with the text. There are many picture clues to help out first grade readers, but it will also become a favorite read aloud for the kindergarten and younger set. 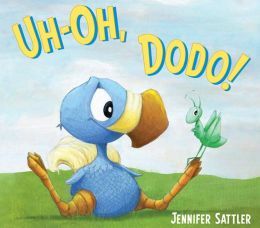 The children can mimic Dodo by walking or singing loudly like he does in the story. Literacy skills like setting, cause and effect, sequencing, picture clues and drawing conclusions can all be strengthened by this colorful book that contains many loveable creatures. Literacy teachers will also want to use this story as a way to begin a writing activity, be it fiction or nonfiction about one time when a student went a walking with Mama and what happened on their marvelous adventure. Get ready for the World Animal Games hosted by Walrus and Cockatoo! 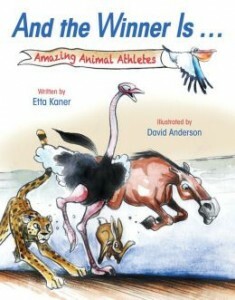 And the Winner Is… gives first grade readers a fun and fantastic opportunity to learn about the super power of animals. And it turns out that animals really are amazing athletes – especially in comparison to humans! The events are high jump, sprinting, weight lifting, swimming, long jump, aerobatics, and the marathon. In each category there are four competitors. Readers are asked to predict who will win and the results are often surprising! The layout of each spread invites readers to pick and choose between small pieces of text according to their reading level. With commentary at the top by Walrus and Cockatoo, game cards for each competitor that give stats on the creature’s class, home, habitat, and food preferences, and witty banter between the athletes and the crowd, there really is something of interest to every reader. One spread introduces the competitor and the next spread declares the winner. This is followed by a comparison of how the winning result compares to the average human. The flea, for example, wins the high jump contest by leaping 150 times its own height. The human high jump record, in comparison, is less than two times the jumper’s height. And the delightful and humbling fact is that the human doesn’t come close to winning in any of these categories. Strange things happen during a visit to the museum. Dave is sure that the dinosaurs are moving. Dad is reading the signs and looking ahead so he does not see any of the activity. As Dave studies the Ankylosaurus, he is sure the dinosaur is winking at him. Dad says that it can’t be, it is only Dave’s imagination. Dad gives the same response when the Deinocheirus tries to tickle Dave, the Allosaurus grins at Dave and the Diplodocus tries to eat Dave’s burger. But even Dad can’t ignore the T. Rex. He has to admit that the T. Rex is indeed following them. “Oh, you’re right, Dave,” said Dad. “That dinosaur’s not dead.” So the final page has Dad and Dave running from the T. Rex. For any child who has tried to get his or her parents’ attention, this book will ring true. The quirky illustrations are sure to delight, especially the Tyrannosaurus Rex with the huge head and the pointed toes. The humor is picked up in the signs posted along the exhibit route and the translations of the dinosaur names. A fun read aloud for a dinosaur or a museum unit. It would make a great literacy activity to have a second grader read to the first grader. With such distinctive voices, it could also be used for reader’s theatre. 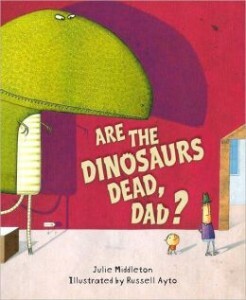 TITLE: Are the Dinosaurs Dead, Dad? For grown-ups and first grade readers and second grade readers alike, this is a really cute story with neat cartoonish pictures. However, it is also an empowering story for young children that will thrill them no end. 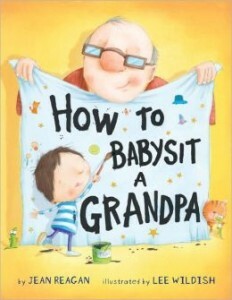 Instead of grandpa doing the babysitting, the main character is and the focus is on keeping grandpa happy and out of trouble until the parents come home. Literacy skills galore can be strengthened like text to illustration correlations, picture clues, inferential skills and foreshadowing as the children will quickly find the humor in what isn’t said on the page. Teachers can use this as a discussion starter as well as a story starter for students to write about, “the time I babysat for my grandpa or grandma.” It could be a fun project for grandparents day, Christmas or any holiday. An art teacher can have a marvelous time with children making illustrations showing some of their favorite activities with grandparents. Or it can take a completely different position in health class by having children illustrate or list a few of things that they would have to be careful about when taking care of others. Basically, though, this is a totally enjoyable read aloud that will be worn out by little people and their grandpas. 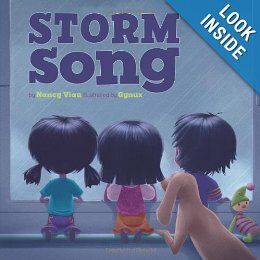 Storm Song is a rollicking read-aloud, great for first grade and will help youngsters appreciate rainstorms. The book brings a rain storm to life through alliteration and strong sensory language. With phrases such as “Pitter, pat, pound!” Viau uses rhythm and language brilliantly to build tension and excitement about a universal experience, being scared yet fascinated by the power of a storm. Through an exploration of many aspects of the storm (the whisking of leaves, the sparkle of lightning, the ticking of a clock in the calming aftermath), the book avoids what could be just another book about rain. When the lights go out, readers experience the confusion of the main characters, two young girls, one boy and an amiable dog, and feel the relief provided by a creative mother who quickly has them pretending to “Row, row, row your boat,” eating popcorn heated over flames, and snoozing comfortably on the couch together. The concluding spreads present the passing of the storm, the dog splashing in the puddles, and the peaceful calm washing over all. The digital images by Gynux complement the text beautifully. From the leaves sweeping across the yard to the expressions of the young characters entranced by lightning, the illustrations capture the emotional energy of the text. First grade teachers will appreciate the “Teacher’s Guide” available at (http://www.nancyviau.com/teachers-guides/). With activities appropriate for K-2nd grade, language arts, drama, art and science, there is something for everyone in this activity collection created with the Common Core in mind. The guide includes pre and post reading questions, a list of other books about storms, reading games that play with onomatopoeia, and lightning experiments.